We specialize in most industries that require answering and messaging services. After all, that’s what we’ve been doing for more than three decades. Property management and real estate is less a 9-to-5 job than ever before. Tenants, owners, vendors and HOA’s all have increasing demands at odd hours, and the business cycle of home buying and selling takes place in the evening as often as it does the day. We’ve been well-trained in the industry for decades. Our staff and messaging functions from Startel are HIPAA compliant, and are strictly monitored to ensure this is enforced. With appointments being scheduled, rescheduled and cancelled, patients can come and go based on the service they receive. Let us become an extension of your office to ensure your patient satisfaction at all times! We have more than four decades of experience – don’t pay for the companies that specialize and charge up to triple our rates! You’ll get the same quality service with the best features available with AnswerLive. Use our on-call scheduling tool to see who on your team is working at what times. Likewise, you can use our online scheduling service to make or change appointments at the push of a button. Let us help build your business, so you can help build for others. Long hours and remote work are a part of the construction industry. Let us help you bridge the gap between jobsites. Our industry-trained operators can keep you connected with employees, vendors and anyone else on the project. Each of our call centers are in small towns. We have hundreds of small business customers and a sterling reputation earned through exceptional professionalism and customer service. This service provides valuable third-party verification which is extremely helpful in the case of employee absentee conflict and keeps you compliant with the Family Medical Leave Act. 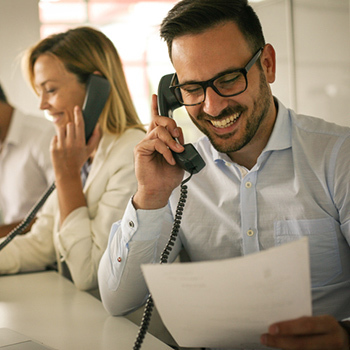 Answering disaster calls in a timely fashion can clear the way for better relationships with adjusters, insurance companies and other companies you work with on a daily basis. Make power outages, flooded street and water main breaks your biggest concern. Leave the rest to us. When issues arrive, we can step in for overflow work and complement your existing customer service team to ensure everyone on your grid feels at ease. Three Decades of Industry Expertise At The Best Rates Available! AnswerLive has more than three decades of experience providing any answering service under the sun to a variety of industries. 2,500 customers tell the tale of our expertise in industries that require a round-the-clock cycle of work. Our success hinges on your company’s success – whether it’s providing the customer with the right information or transferring them to the right person at the proper time. Try AnswerLive to spark your customer experience today! Fast onboarding process – start this week! Our professional staff will present you to prospective tenants or customers in a positive light. Use our on-call or online scheduling service to manage showings, move-ins, inspections and closings. Simplify your billing with our sub-account billing option. Find out more and get a two-week free trial today! Your patients need to reach you 100% of the time. Our client service portal – which is fully redundant and disaster proof – helps you find messages, schedule appointments, track who is on call. A law office often never sleeps. Our live remote receptionist helps you to effectively manage your calls – to your office, cell phone, email, for a small fraction of the cost of hiring an employee. Our operators are well-trained in dealing with the needs of tradespeople – HVAC, plumbing, electrical and others — and their customers, so when a lifetime customer with a busted pipe or broken down air conditioner needs a quick response, we’re on it right away – and so are you. If you miss a call as a contractor or construction business, you could be missing a job. Whether you’re independent or part of a large firm, you can rely on AnswerLive for the proper support and coverage you need to ensure your contracting business gives its clients what they want, when they want it. We have been serving small business across North America for more than four decades. We understand the needs and requirements of small business owners. Serving them is our top priority, which is reflected in our belief in personal account management and low-cost pricing structures. When an employee needs to call off sick, they only need to call a designated telephone number and report their absence/tardiness. They don’t need to track down their manager. Our operators gather specific information in accordance with your custom script – such as name, department, reason for absence, date, shift – so we can provide the caller with a specific confirmation number and then dispatch the message to the appropriate supervisor. A missed call is a major missed opportunity in cleaning & restoration. Disasters can happen anytime, anywhere. Your business is not only based on this fact, it thrives in being the quickest to respond. When you need a helping hand in the middle of the night, AnswerLive takes the call. You are responsible for your municipality infrastructure. You know what can go wrong – often at the worst times. Gas leaks, water main breaks, power outages – a quick solution is needed not just to fix the issue, but to assure all affected people they are safe, secure, and in the loop.